Observing from the railway station in Treblinka on a hot Monday, 2 August 1943, at 15.45 we saw huge wreaths of smoke mixed with tongues of fire in the skies over the death camp. It was different smoke from that which we saw every day, that smoke of martyrdom. At the same time the sound of shots and detonations grew nearer. We began to realize that a revolt had broken out in the camp, that the camp had been set on fire by the Jews and that fighting was going on there. Several hundred Jewish workers from the camp staff had organized the uprising. At the same time as SS men and Ukrainians (two changes of guards) had gone by cars and bicycles to swim in the River Bug, the Jews, who had previously captured a small quantity of weaponry from the armoury, set fire to the barracks and threw grenades. They shot at the guards, destroyed the gate, and broke out from the camp, escaping wherever they could. A large group of Jews probably used directions given by me and made for the forests over the River Bug, near the village of Glina. It later appeared that in the crossing of the River Bug, a unit of the Home Army under Stanislaw Siwek helped and protected the Jews. Immediately the whole region was placed on alert. SS men and Ukrainians, returning very quickly from their bathing in the River Bug, dressed themselves in their vehicles. To aid the camp staff the Bahnschutzpolizei, army and gendarmes from Kosow Lacki, Sokolow Podlaski, Ostrowek, Malkinia, Ostrow Mazowiecka, and even the fire brigade, called by Germans from Malkinia, arrived at Treblinka. All roads were blocked. A hunt for the Jews was organized. There were many telephone calls to railway stations in the region. The German railway workers from neighbouring stations asked us what was happening in Treblinka. We answered that we knew nothing. The camp burned until 18:00. Many Jews, not knowing the region, stayed in the vicinity. They were captured, taken to the camp or bestially killed on the spot. The Germans issued a decree to the Polish inhabitants, stating that anybody offering help to the Jews would be punished by death. Despite this decree, many Poles provided the opportunity of hiding to the escaped Jews, and under the protection of night transferred them to a safer place, or showed them a secure direction. This happened in the villages of Maliszewa, Grady, and Kielczew. There were also incidents where Jews, resigned to their fate, refused help and after several days returned to the camp to a voluntary death – to go where their entire families had already gone. Poles also suffered because some of them had helped the Jews; beaten and tormented Poles were sent to the labour camp (Treblinka 1). Following the burning of the death camp and the escape of most of the prisoners, the lack of workers in the death camp was supplemented by Jews from the labour camp. After a break of several days the death camp began operating once again, but now only 10 wagons were taken onto the ramp at any one time. During the revolt the gas chambers and the ramp had not been destroyed. We had been surprised that until then, during the entire extermination action, the transports had been divided into sections of 20 wagons for unloading purposes. We reasoned that the Germans were probably concerned even then about this mass of several thousand people and they took into account the possibility of Jewish resistance, which might be difficult to suppress in the case of a complete transport. The Germans had the use of machine guns with which to terrorize the prisoners and to kill them, but this did not conform to German plans. It was not to be unexpected that after the uprising they would anticipate another revolt by the Jews, and as a consequence they decided to take a lesser number of wagons onto the ramp. The destruction within the camp was probably substantial. We heard that about 50% of the buildings were destroyed. But the action to annihilate the Jews did not stop. The transports were sent to other camps and they went via Treblinka in transit. On 18 August 1943, a transport of Jews “PJ 201" (32 wagons) went to Lublin from Bialystok via Treblinka. On 19 August, the transport “PJ 203" (40 wagons) went to Lublin from Bialystok via Treblinka. On 19 August, the last transport of Jews from Bialystok, “PJ 204" (39 wagons), arrived at Treblinka. On 24 August, transport “PJ 209" (9 wagons) went to Lublin via Treblinka. and on 17 September, transport “PJ 1025" (50 wagons) of Jews from Minsk Litewski was sent to Chelm (in fact to Sobibor). All of this information is taken from records which I made and from which I created copies at the end of the war, copies which I still have to this day. Observing the smaller number of wagons, and the hiatus in the transports of the Jews to the camp, as well as the redirection of transports to other camps, we anticipated that the camp would be liquidated. On 20 October 1943, the Jewish workers were sent to Sobibor in five covered wagons. They were described in the documentation as prisoners. The remaining Jews were sent to Sobibor on 4 November. The liquidation of the Treblinka death camp occupied the whole of October, and part of November 1943. 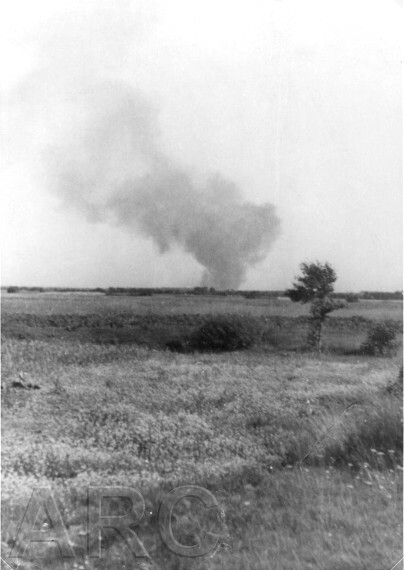 On 31 October, the engines and other metal parts were sent from Treblinka. Finally, on 5 November, the armoured car left. From the beginning of the liquidation of the camp until 17 November 1943, more then 100 wagons with equipment were dispatched from there. On 17 November 1943 the Ukrainian guards were sent to Lublin. Franciszek Zabecki: Wspomnienia stare i nowe. Warszawa 1977, p. 94-99.